Electron beam additive manufacturing is a rapidly growing industry. Electron guns capable of reaching higher energies and higher average power can enable larger melt pools, higher production speed, and permit broader range of materials for metal additive applications. Such electron guns require technologies beyond those normally achieved with DC high voltage sources. As an example, superconducting radio frequency (SRF) technology is an option to achieve higher energy and higher power with excellent efficiency. However, current SRF technology requires complex cryogenic systems to safely handle cryogenics gases or liquids such as Helium. Such complexity severely restricts their usage to R&D facilities. 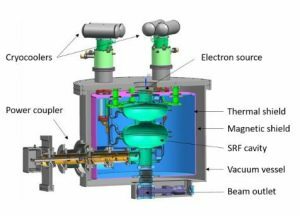 Fermilab has developed a high power, high energy superconducting radio-frequency electron gun for advanced metal additive manufacturing applications. The novel design is based on a technique that eliminates liquid Helium entirely and dramatically reduces the complexity of the system. Cryostat housing the conduction cooled SRF electron gun.